What’s the most expensive car manual we ever sold? 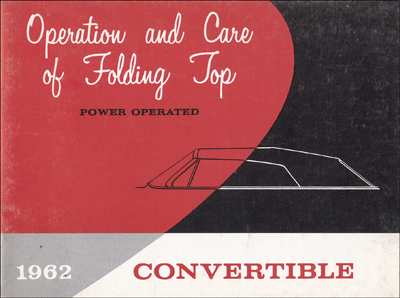 The answer is a tiny little convertible top owner’s manual – little more than a pamphlet. It’s the size of an index card and has less than 20 pages. The booklet describes how to lower and raise the top, install the top boot, care for the rear window, and clean the material. Which top book brought the big bucks? Why are convertible top books so rare? In part, it’s because of their small size – owners often lost them or threw them away. They are also rare because only convertibles came equipped with them, so there were fewer in the first place than other types of literature. Can I get an owner’s manual for my convertible top? Not every convertible has a separate top owner’s manual. Often, care of the top is included in the owner’s manual for the car. However, separate books were made for some vehicles, such as 1930’s Fords, most 1930’s-1960’s GM convertibles, and a random sprinkling of other cars – for example, a 1949 Plymouth, some Mercedes, and some 1980’s and 1990’s convertibles that were sold as factory models but were actually chopped by aftermarket companies like ASC. Whether your vehicle is a classic convertible, a beat up pickup truck, or a daily driver, you can find your manuals at Faxon Auto Literature. Call us up and let us help you find that manual to go with your favorite car or truck 1-888-458-2734 – Monday – Friday 7 am to 5 pm Pacific Time, Saturday 8:30 am to 1:30 pm, or visit us on the web at www.faxonautolit.com.